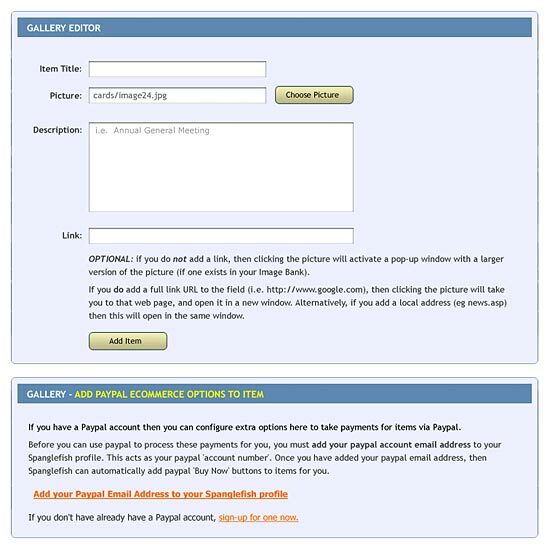 As well as providing an elegant way to display lots of images, the Spanglefish Page Gallery facility also offers a convenient and quick way for you to set up a simple online shop and sell items using PayPal as the payment processor and PayPal Cart [cart for multiple items only available if you have upgraded to Spanglefish GOLD]. 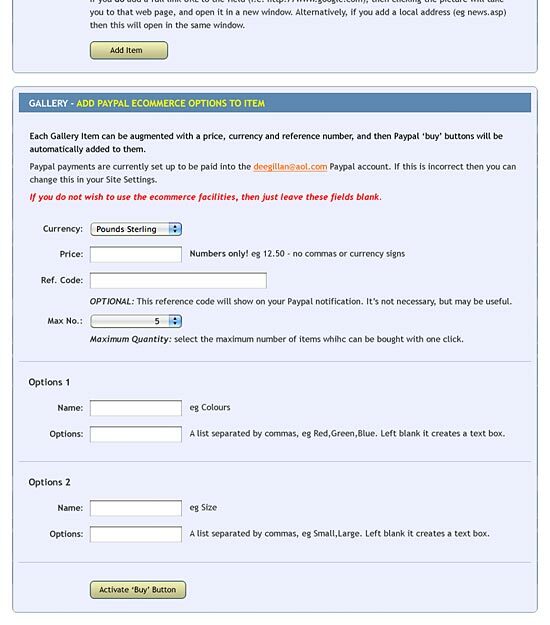 To enable these additional Shop configuration options, you must first enter your PayPal address into your Site Settings > General Settings > Site Email Addresses section. 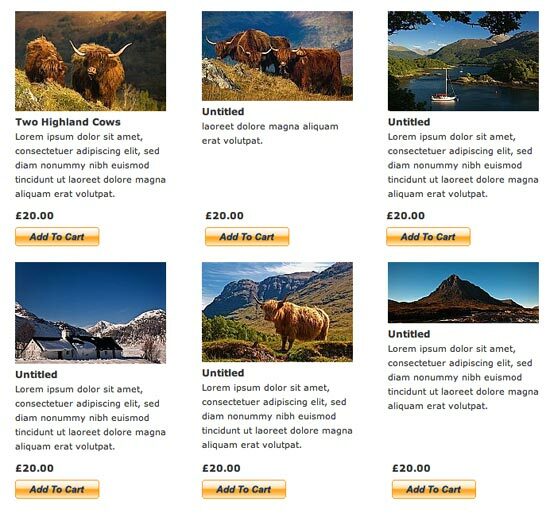 Once that's done, your site 'recognises' that you are a PayPal user, and will now automatically provide additional options when you add a Gallery item. As you'll see, the 'PayPal Ecommerce Options' panel below the Gallery Item editor has now expanded, offering you various additional options that you can set for the item, including currency, price, reference code if you have one, and a maximum number of the items the buyer can buy. In addition you can provide extra options for things like size or colour. 6) Click on the 'Activate Buy Button' to confirm the changes and activate the sale. The Gallery on your page will now look something like this . . .
Each item now displays a price (and other options if you set them), and automatically includes a PayPal 'Add To Cart' button. The user can now click on one of these to add an item to their cart on PayPal, and click on PayPal's 'Continue Shopping' to return to your site to add more items. Once finished shopping, the buyer then clicks on the Checkout button to go to Paypal to pay for the items they want, and PayPal places that (minus their fees) into your account. * Note that we have no affiliation with PayPal Inc. We provide this link for your convenience only.